By James W. Fatherree, M.Sc. 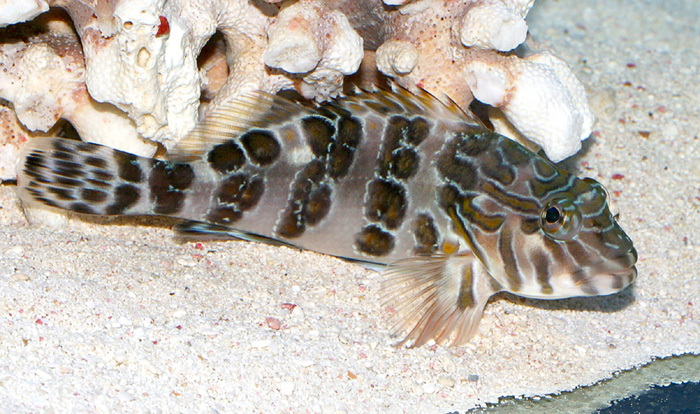 There are several species of hawkfishes available to hobbyists that can be great additions to marine aquariums. In general, they’re quite hardy, easy to care for and attractive. Most are colorful and covered with spots, stripes, and/or blotches of some sort. Many species have unique body forms, and they often have very interesting personalities, too. It’s for good reasons that the hawkfishes are a popular group of fishes. However, hawkfishes are by no means a perfect fish for everyone and every tank as they can be entirely incompatible with many other marine fishes and invertebrates. 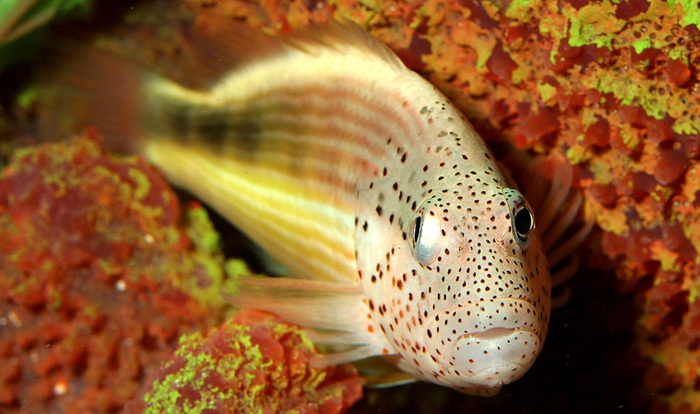 Problems can arise if a hawkfish acts aggressively towards other fishes, as many often do, and many will eat a variety of small fishes and invertebrates, as well. So,despite the temptation they should be avoided in many instances, lest they harass and/or kill any unsuitable tankmates. 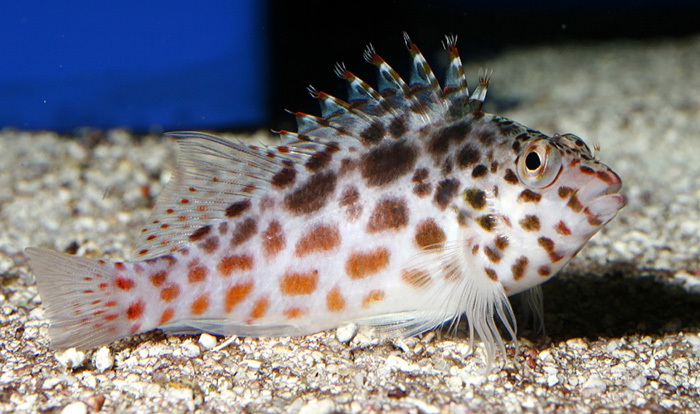 With this in mind, we’ll take a look at some of the hawkfish species offered to aquarists and some of the problems they may present if introduced to an aquarium. But first, lets look at some general information about the whole lot of them before getting to the individual species. As mentioned above, hawkfishes are typically very hardy and resistant to disease, and will eat a wide variety of aquarium foods including flake food, brine shrimp, any sort of meat, etc. However, they also eat some things you may miss, and they can also be downright mean to other fishes at times. Individuals are typically intolerant of other hawkfishes, particularly if they are the same species, and they oftentimes don’t like other sorts of fishes around their size or smaller either. This is especially true for small fishes that hang around the bottom and on the rockwork/decorations, such as blennies and gobies. 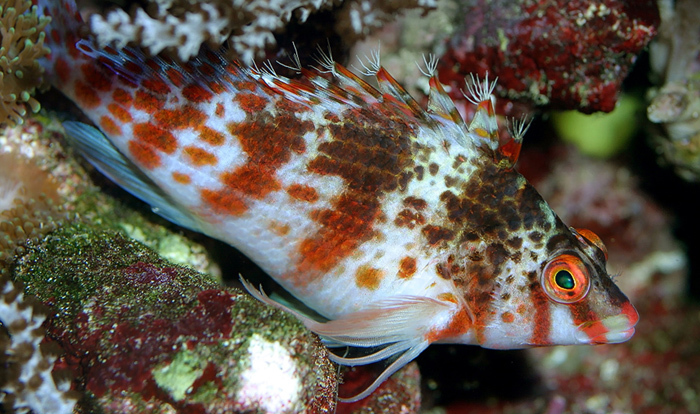 Hawkfish often perch atop pieces of rockwork and soft and stony corals and then dive down onto prey items below, which is where the “hawk” name comes from, and they can also be very territorial. Sometimes they’ll even harass more passive fishes that are larger than they are, chasing and charging another fish until it’s worn out. They may not do any real damage, but this can still leave a pursued fish weakened and stressed out, which often leads to disease and death. 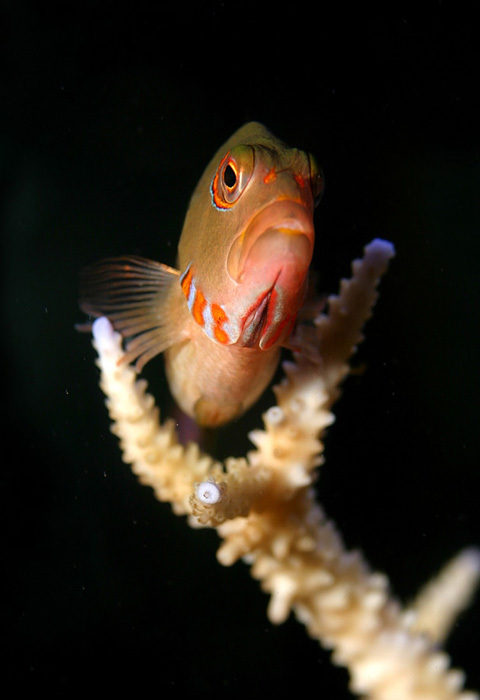 This type of behavior is especially common if a hawkfish is introduced to an aquarium early on and claims a large territory as their own. In such cases, later additions, big or small, more than likely will not get a warm welcome. Thus, it’s usually better to add a hawkfish after any other fishes you wish to keep have already been in the tank a while. Of course, if everything else is much bigger this may not be an issue you need to worry about, but then again, I’ve been surprised at times by the ferocity displayed by some hawkfishes. An exception is when a mated pair of hawkfishes are offered together, which means a male/female couple were collected together simultaneously, shipped together, and are sold together. In the wild, males often have a harem of a few females, but trying to create a mated pair in your own aquarium by adding two or more hawkfishes is still very likely to fail. 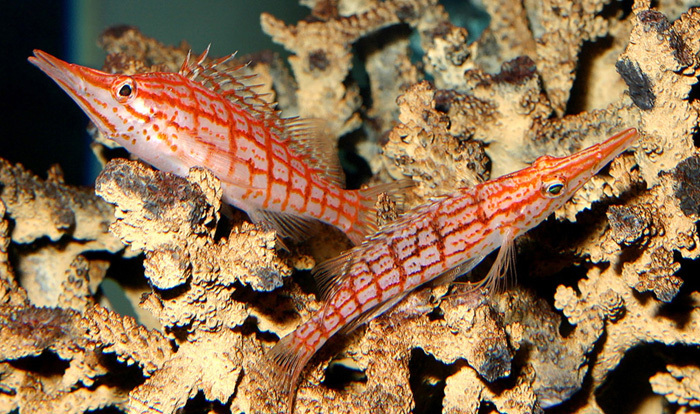 However, if you do have a very large aquarium, with plenty of places for a hawkfish to call home, it may be possible to successfully keep more than one, or even a few. It’s not likely, but it’s not impossible either. With that said, let’s go ahead and take a look at a few individual species. You’ll see that they are generally similar in behavior and attitude, but there are some other things to note, too. Also be aware that while I provide the maximum reported sizes of each species (from Fishbase.org), they rarely reach such lengths in aquariums. For example, the maximum size for a longnose hawkfish in the wild is about five inches, but most won’t grow any larger than about four inches, and some won’t even get that large. The Dwarf Hawkfish The dwarf hawkfish, Cirrhitichthys falco, also called the falco hawk, reaches a full size of only 2.75 inches, which is why they’re called dwarfs. They’ll likely eat any really tiny fishes, crabs, or shrimps kept in an aquarium with them, and may also try to eat any small hermit crabs, too. However, they should be fine with any other types of invertebrates, like clams or snails, and won’t harm corals either. If you have no crabs, shrimps, or tiny fishes, these will be fine as far as not eating any tankmates goes. Unfortunately, dwarf hawkfish can be rather aggressive towards other fishes, and you shouldn’t try keeping more than one dwarf hawk, or any other small hawkfishes with one either. They oftentimes will pester other types of small fishes too, but because they’re relatively small (oftentimes only two inches or so), they usually aren’t too much of a problem. Most damselfishes and other sorts of small aggressive fishes should be fine. Another thing to mention is that some dwarf hawks don’t spend much time perching, and some don’t perch at all. To the contrary, many tend to spend more time moving around the bottom area of tanks, and on the substrate itself, rather than higher up. The Arc-eye Hawkfish The arc-eye hawkfish, Paracirrhites arcatus, reaches a full size of about 7.9 inches and has a horseshoe-shaped line that arcs behind its eyes. This species typically has a large white stripe down both sides of its fleshy-colored body, too. However, they do come in a range of colors, as many are fleshy with the arc and stripes, while some are dark brown, or something in between the two. The darker individuals still have the arc behind the eye, but some lack the white stripes on the body. Being much larger than the dwarf hawk, arc-eyes can take food that is also larger and can also harass bigger fishes as well, including other hawkfishes. Yes, they’ll eat shrimps and crabs, etc., and I’ve seen a big arc-eye gulp down a small damsel. Unlike the dwarf hawk, these do love perching in the branches of stony corals and on rockwork. 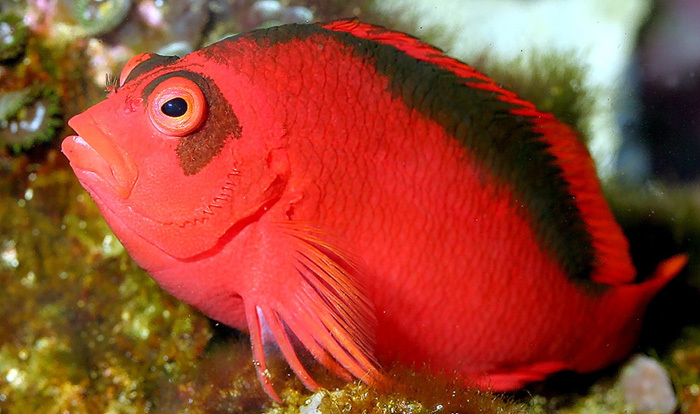 The Flame Hawkfish The flame hawkfish, Neocirrhites armatus, which is sometimes called a scarlet hawkfish, is particularly popular due to its bold red color. They can also get larger than the dwarf hawkfish, but not much, as they have a full size of about 3.5 inches. Again, small shrimps, hermits, crabs, or other sorts of crustaceans are likely to be eaten. However, flame hawks may go even further, and have been known to eat snails and tubeworms, too. Corals, anemones, clams, and other sizeable fishes should be safe, though. Flame hawks are definitely perchers, as they particularly enjoy sitting in the branches of stony corals, but their beauty is typically matched with a bad attitude. They can be particularly nasty to small fishes, so I suggest you keep them with bigger fishes, or at least other similar-sized fishes that can take care of themselves. I certainly wouldn’t try any other hawkfishes either. The Freckled Hawkfish The freckled hawkfish, Paracirrhites forsteri, which is sometimes called a blackside or Foster’s hawkfish, is also easy to identify. Their faces are covered with black freckles, and they typically have black patches down their backs, as well as a white stripe like that of an arc-eye. Freckled hawks can also get relatively large, as they can reach a full size of around 8.7 inches. Due to their larger size, things are quite different when it comes to where they can be kept and what is safe with them. 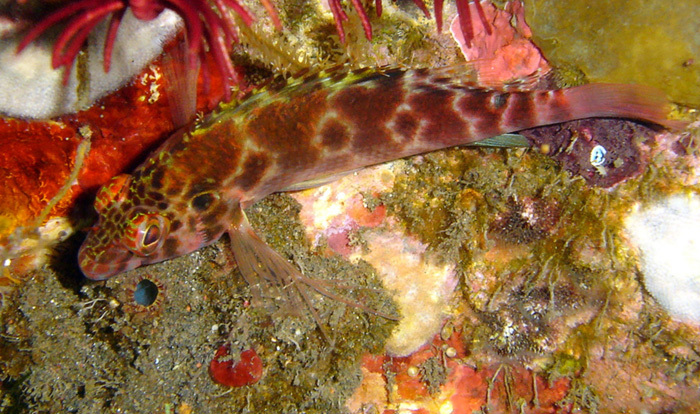 Not only will they eat small fishes, they’ll eat medium ones, too, such as damsels, blennies, gobies, etc. Crabs, shrimps, and such of any size will likely disappear quickly, as well. And they can also be aggressive, so keeping a freckled hawk in a reef aquarium is not a good idea at all. These are best kept in a large fish aquarium, with other bigger fishes that can take care of themselves. The Longnose Hawkfish The longnose hawkfish, Oxycirrhites typus, is one of the most popular species due to its unusual coloration and its long beak-like snout. Seeing the snout on this fish makes it easy to see where the name comes from, as it looks quite different. They’re also a medium-size hawk, reaching a full size of 5.1 inches, and can be just as aggressive as any of the rest. Again, only one should be kept in most aquariums, and they can harass or eat small tankmates. Obviously you shouldn’t try any small shrimps, hermits, or crabs either, although corals and such will be okay. Also note is that their snout can be quite deceiving. If you look closely, a longnose’s snout may look like it has a small opening and shouldn’t be very dangerous, but that’s not the case. The snout is actually more like a bird’s beak and it can open up surprisingly wide. These fishes can gulp down food items much larger than what you’d think, so don’t underestimate their ability. The Pixy Hawkfish The pixy hawkfish, Cirrhitichthys oxycephalus, which is sometimes called a coral hawk, can grow to a full size of about 3.9 inches. Like the dwarf hawk, these will also eat any really small fishes, shrimps, hermits, crabs, or other sorts of crustaceans, but not corals or other animals you may keep. However, they are much more likely to perch on corals, decorations, and such, rather than spend time at/near the bottom. Pixies can also be quite aggressive for their smaller size, and again you shouldn’t try keeping any other hawkfishes with one. They can also pester other small fishes, but shouldn’t create any problems for bigger or more aggressive fishes. The Threadfin Hawkfish The threadfin hawkfish, Cirrhitichthys aprinus, which is also called a spotted or blotched or hawk at times, can reach a full size of about 4.9 inches. They are indeed spotted/blotched, but the threadfin name comes from their having an extra long fin ray in the middle of their backs. Other than looking just a little different and having a different name, these are essentially the same as the other species when it comes to feeding and behavior. They will eat small crustaceans and fishes if given the opportunity, but everything else should be safe. They also should be kept one to a tank, and not with fishes that are small enough or passive enough to be picked on too much. The Yellow Hawkfish The yellow hawkfish, Cirrhitichthys aureus, is another medium-sized species, reaching a full size of around 5.5 inches. They aren’t really bright yellow, like a yellow tang, but they’re still attractive fishes, nonetheless. Yet again, only one should be kept in most aquariums, and they can harass or eat small tankmates. No, you shouldn’t try any small shrimps, hermits, or crabs either, but corals, etc. will be fine. 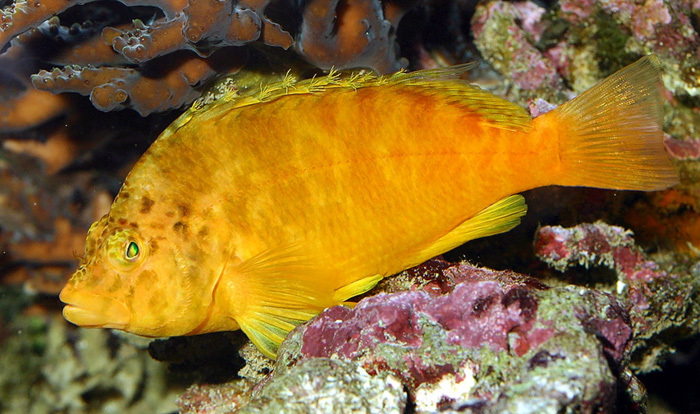 The yellow hawk also shares a particular trait with many dwarf hawkfishes, as they may choose to hang around near the bottom of aquariums more than the upper areas. But, other than that, their behavior is basically the same that of all the other species, often being aggressive, particularly towards smaller fishes and other hawkfishes. The Giant Hawkfish Lastly, we get to the giant hawkfish, Cirrhitus rivulatus. This one isn’t as commonly offered in the hobby, and I’m guessing this is due to its full size of 23.6 inches. 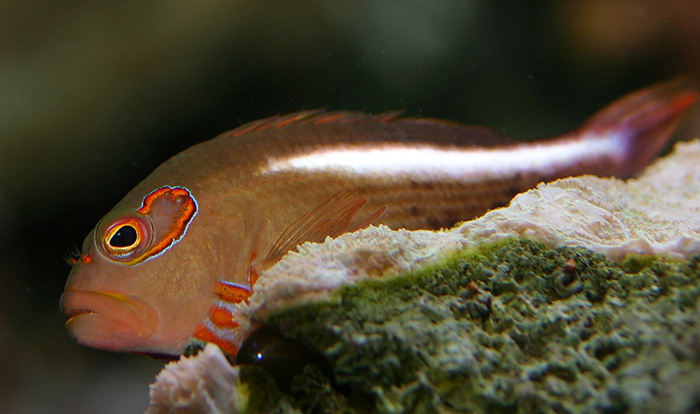 Yes, despite being a hawkfish, it’s one of the biggest fishes you can buy. While they spend much of their time hanging out in crevices and holes when small, they will perch on things at times, and become more and more prone to do so as they grow in size. So, they can be very impressive addition to a very large aquarium. As you can probably guess by now, these will not be safe with much of any fishes smaller or of similar size than they are, and won’t get along with any other hawkfishes, either. They’ll also eat crabs, shrimps, and such. So, these are really only suited for big aquariums that house other big fishes, regardless of how nice they may look when small.